Israeli sister trio A-Wa are a band who, in their own words, “combine Yemenite folk singing with electronic dance music.” Last week they released their Habib Galbi EP which includes the title track, five remixes of it, and two other songs. Check out the video for “Habib Galbi” below. A-Wa are over in the US right now, playing LA tonight (3/16) followed by a few shows at SXSW. They’ll make their NYC debut on March 23 at Le Poisson Rouge with Sway Machinery. Tickets for LPR are on sale. All dates are listed below. Speaking of Israeli bands at SXSW, two are playing the free BrooklynVegan Friday day party at Cheer Up Charlies (RSVP). At noon inside is shoeogazers Vaadat Charigim (who BV readers are probably familiar with), and then it’s alt-pop singer Ninet Tayeb right after them at 12:45 PM. 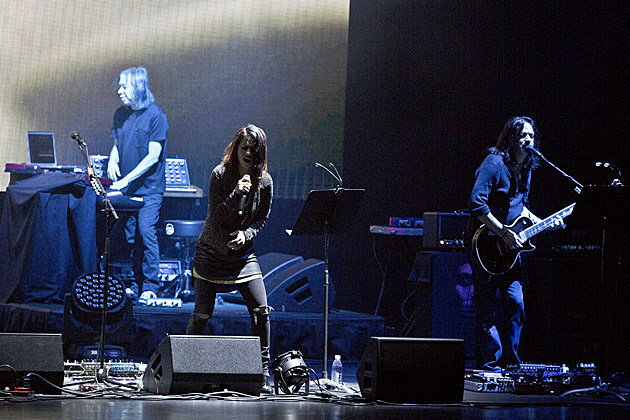 In addition to her own material, Ninet also sings with Porcupine Tree’s Steven Wilson. She’s on his recent releases Hand. Cannot. Erase. and 4 1/2, and has performed with him on tour, including recently at Beacon Theatre in NYC. That’s a picture of her from that show, above.